1. They're the worst human beings on the planet. And not because they're rich douchebags (we dream of being rich douchebags ourselves, someday). 2. That semi-aggressive version of a peace sign they constantly flash anytime something good or medium happens. They form their pointer and middle finger into a 'V' for 'victory'. Clever, right? It’s the worst tradition in the history of traditions. 3. Sweet inside sunglasses, bro. 4. They only show up when things are going well. Last year, despite opening the season ranked No. 1 in the country, USC finished 7-5. That wasn’t enough to get its head coach fired. The difference this year? People stopped showing up to the games. USC ran out of fans. Declining attendance after a slow start to the season contributed to the decision to make a coaching change. 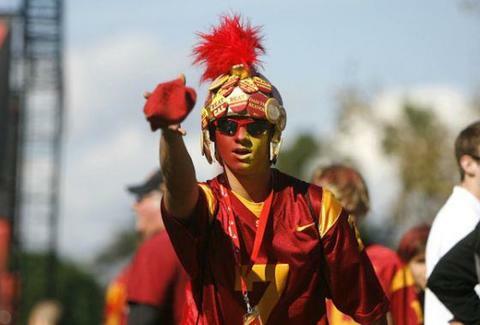 So all those people you see walking around in their USC t-shirts with car flags now that USC won five straight games and beat down Stanford? Most of them weren’t doing their peace signs a mere month ago. 5. They have car flags. 6. They liked this guy. 8. They gave a guy with a visor collection $20 million. 9. And finally, they made this video. On purpose.